To put it mildly, this summer may have been our best ever. For some reasons you’d expect and others surprisingly unexpected. As I’ve already mentioned (maybe too many times) for years we’ve dreamed of taking our children to England and this is the year we made it happen. Now that we are home and the kids have started school again, I’m finally going through my pictures (there are a lot) and thought I’d share a few of the good ones. So if you’re only here for the fabric and quilts, hang tight, there are a few of those still in this post. Hopefully the rest of the subject matter is pretty enough to sit through. And if not, we’ll get back to the fabric stuff next time. We started our journey in the Northwest in the Lake District. The Lakes are a very popular tourist destination in the UK – and with good reason. They’re pretty scenic (understatement). The photo at the beginning of the post is taken from the top of Orrest Head near Lake Windermere. This is beautiful Avenham park in Preston, England. My husband and I each lived in the northwest of England for a period of time in our early 20’s as Mormon missionaries, where we overlapped briefly. In fact the fist time we ever met was in Avenham Park. It was one brief and totally awkward conversation but it was enough that when we met again 18 months later, when I was back in college, that we had a good jumping off point to continue the conversation. And it gives us the chance to say we met in a pretty awesome location. We showed our kids, who I think were mostly impressed, if not a little wary of the mushiness factor. Our goal for this experience was to introduce our children to people and places that we love, and to spend time with them, but also to get our kids outside their comfort zone. Obviously England is not a drastically different culture from America, but there are subtle differences living in Europe vs the US. We also wanted them to see the history in a country with a much older history than our own. I’ve lived and traveled in Europe on multiple occasions and I’m pretty good and going hard as a tourist, seeing a lot each day. With our kids with us, however, I definitely had to re-calibrate my expectations. There were some days when “seeing another old building” was just not what they wanted to do. 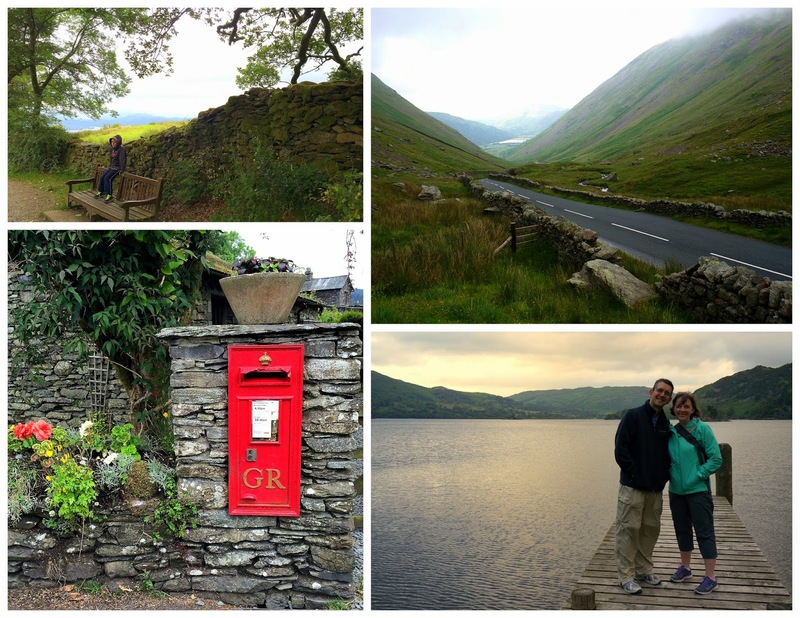 For most of our time in England, we rented a little cottage outside of Manchester and took day trips from there. I highly recommend a little cottage or flat (apartment) when traveling with kids. There are a wide variety of vacation rentals to be found via TripAdvisor, Bookings.com, etc. We have four kids so it was definitely less expensive than multiple hotel rooms, not to mention having a kitchen meant we could cook our own food and make eating much less expensive. Plus it added to the real living in another country experience. We could walk to the shop (aka grocery store), my boys loved playing “footy” (soccer) with lads at the nearby park, and it just gave them more stability and routine on a long trip away from home. Having lived in England a couple of times, we spent some of our time visiting places I’d been before like York – which I’d visited as a college student 21 years ago. I remembered really liking it and going back it exceeded my memories of how much I loved it. I also loved visiting new-to-me-places. One of which was Lyme Park a “great house” just outside of Manchester. If you’re a Jane Austen and/or Colin Firth fan you might recognize it as Pemberley from the 1995 BBC Pride and Prejudice. Someone recommended this to me right before we left and it turned out to be one of my favorite days of our trip. Such a beautiful spot. We could have spent hours more exploring the extensive grounds if we’d had the time. We could not believe what spectacular weather we had while we were there. Our kids got sick of my husband and I saying “And the weather was SO beautiful” every day, but he and I knew that it easily could have rained every day. That said, rain is not all bad. I think if I lived in England, my garden would be so much more lovely. Check out those hydrangeas. They were huge! 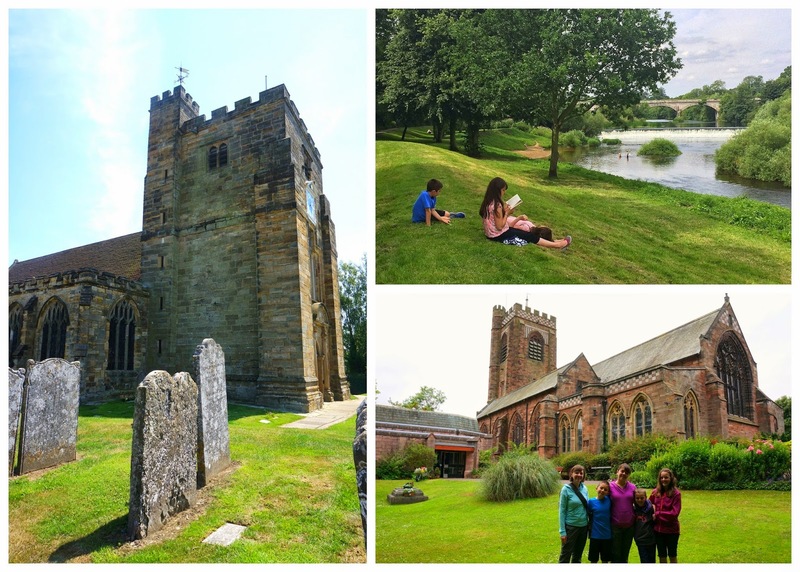 Another favorite aspect of the trip for me was visiting towns where my English ancestors came from. I LOVE family history and learning more about where I came from – each of these places were little villages where my grandparents’ parents and grandparents came from. Where they’d been born, christened and buried. (The marker in front of the headstone above marks my ancestor John Udall. Good thing too, since the headstone is completely unreadable now.) I have lots of British heritage which is I think another reason I feel like part of me belongs there. I think some of my favorite (or favourite) parts of the trip were things that we hadn’t planned that seemed to magically fall into our path. 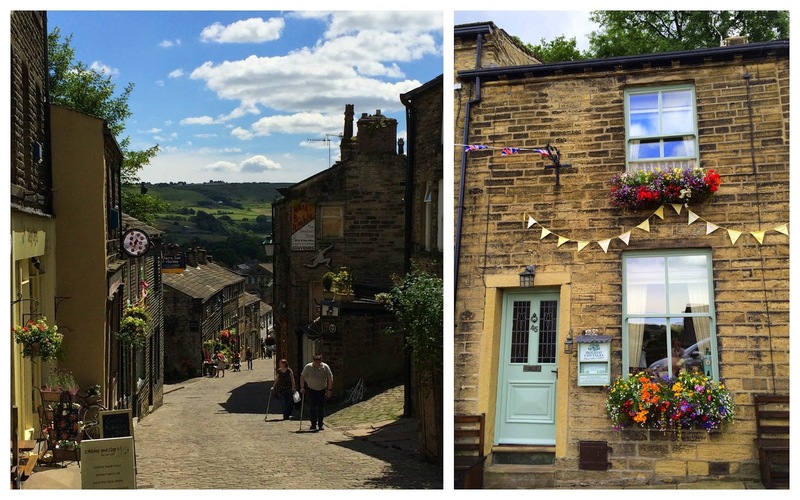 For example, we drove up through Yorkshire to Haworth one day for an outing. By sheer coincidence we drove along the route that had been used for the opening stages of the Tour de France only a few days earlier. There was bunting lining the route along country and village roads for miles. 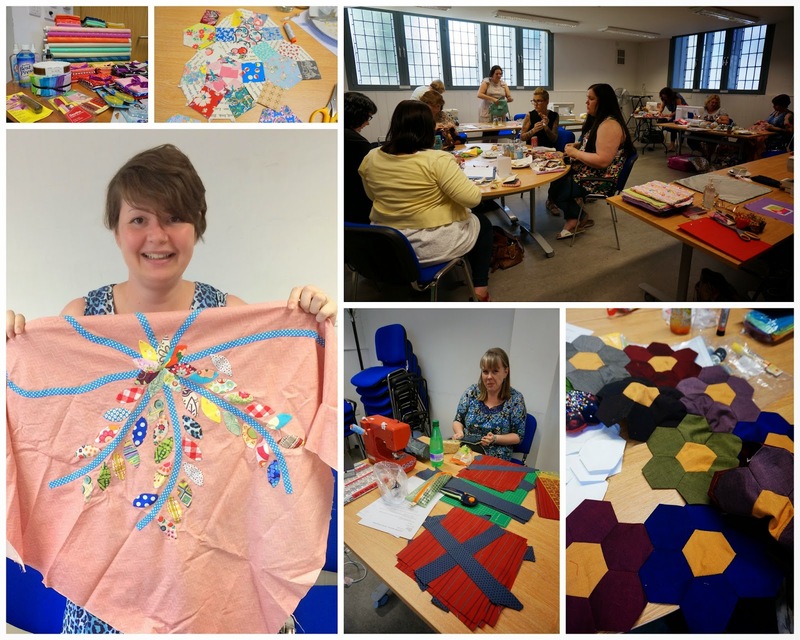 Another one of those things that I couldn’t have planned was getting to visit a meeting of the Leeds Modern Quilt Guild. Awesome Justine noticed via Instgram that I was not far away and invited me to come. The day could not have worked out better as we were going to be driving through Leeds on the way to York that same day. So my nice family dropped me off and kept themselves entertained while I got to visit with these lovely ladies. Such a good time! I loved seeing what everyone was working on and I even got introduced to the famous (or infamous?) Greggs pasties thanks to Katy. Speaking of Katy, I also got to see Issue One of her new baby, the magazine Quilt Now and it’s fantastic! This is published in the UK so there are no direct US subscriptions as of right now, but you can order Issue 1 (while supplies last) or subscribe through Pink Castle Fabrics. Another extra special place we were able to visit is the Isle of Man. I lived here 19 summers ago (also while serving my Mormon mission) for 6 months. This was my first visit back and it was WONDERFUL! It’s such a beautiful place. 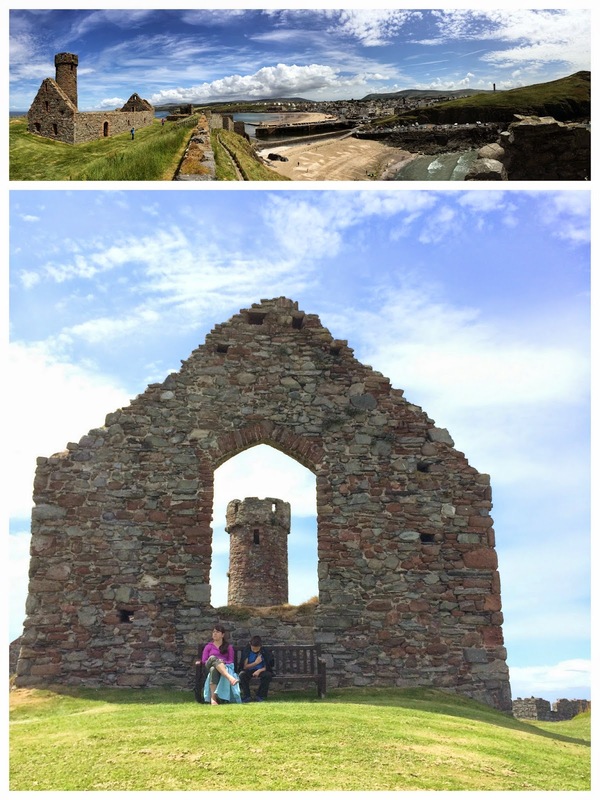 These are the ruins of Peel Castle (about 1500 years old) outside the town of Peel. 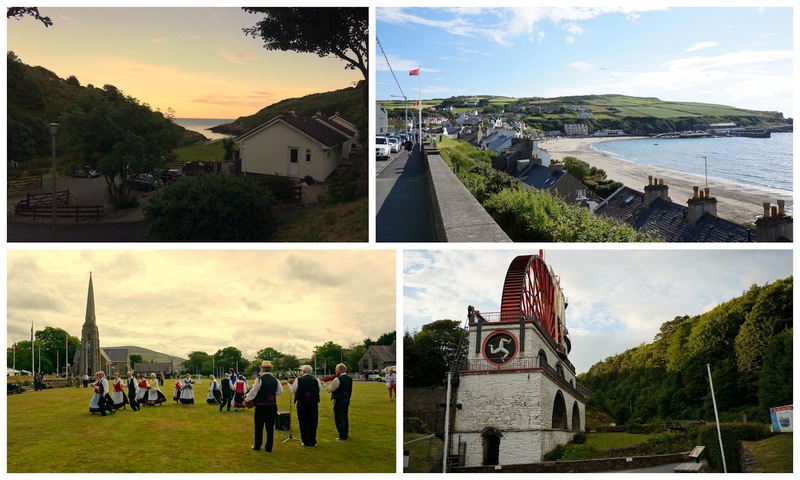 Here are some views of Cregneash Village. So many shades of green. (The Isle of Man sits in the Irish Sea between England and Ireland, so it’s not too surprising that it’s so green.) And I love the pop of color from those red post boxes and phone booths. I may be slightly obsessed with them. Oh London. It’s the best! Here is Trafalgar Square, St. Paul’s Cathedral, and Buckingham Palace as seen from the bridge in St. James park. I lived in London as a University student for a semester abroad which was one of the best times of my life. I still love to visit London and just wander through the streets. Happy, happy memories. And I’m happy to say that London obliged and provided lots of new memories too. 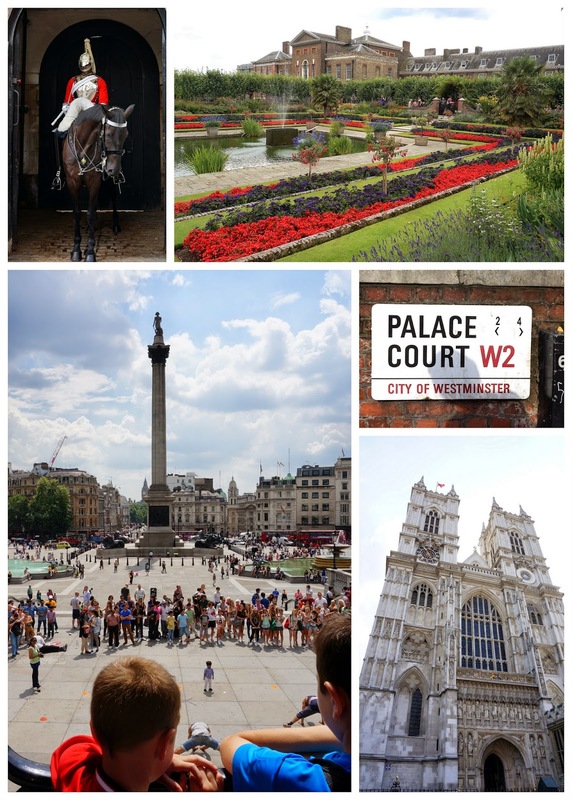 I loved taking my kids on the Tube and the big red buses, walking through the parks, climbing the Lions at Trafalgar square, and touring the Tower of London. They even obliged me in visiting my old digs at Palace Court, not far from Kensington Palace where Will and Kate and baby George live. I have to say that I was really sad when it was time to come home. Not that I didn’t miss people at home, but I really loved our time in England. I would move there – or at least return for another extended stay – in a heart-beat. I am so THANKFUL that we had this opportunity. It has been interesting to see the different ways we have each processed it and been affected by it. I do think it broadened my children’s perspective in very healthy ways. The thing that has surprised me is how much I have been affected by the experience. As much as I loved the experience of just being in England itself, I am also realizing that I loved the simplicity of our lives while we were there. We brought very little with us and it was so liberating to travel light and not have to keep track of stuff. We lived in much smaller accommodations than our house at home. And we got to spend a lot of time together with out having to worry about getting different kids to different lessons or teams or schools all on a different schedule. The whole experience has made me realize how much I want to simplify our lives and to get rid of clutter – both physical and emotional clutter. Since coming home I’ve been cleaning out our house like crazy and took a big pile to the Good Will last Saturday. I’m also starting to say No to more and to better differentiate between things I need to do and things that are nice to do, but really aren’t really that important. I wouldn’t have predicted this effect on me and I’m really grateful for it. I have a few more quilt-inspired pictures to share from our trip, but I’ll save those for other posts down the road. Thank you so much to all of you for sharing such generous and genuine excitement and kind words that we could live this dream. (I’m a big believer in abundance mentality. Expect good things to happen to you and be happy for the good things that happen to others.) I truly hope you hold onto your own dreams and do what you can to make them happen. The outcome may be better – and even more slightly unexpected – than you think! PS I learned a lot from this adventure and put together a list of 14 tips for traveling in Europe with kids. Great post, really enjoyed reading this and seeing your photos. What a lovley post filled with beautiful photographs. England is so green. It sounds like you had a fantastic time and a real break from your regular life at home. That&#39;s interesting that it&#39;s made you see your family routines in a different light. Good luck with simplifying your life a bit. Loved this post. A trip to England is moving up on my bucket list. May I suggest two items for you to read? 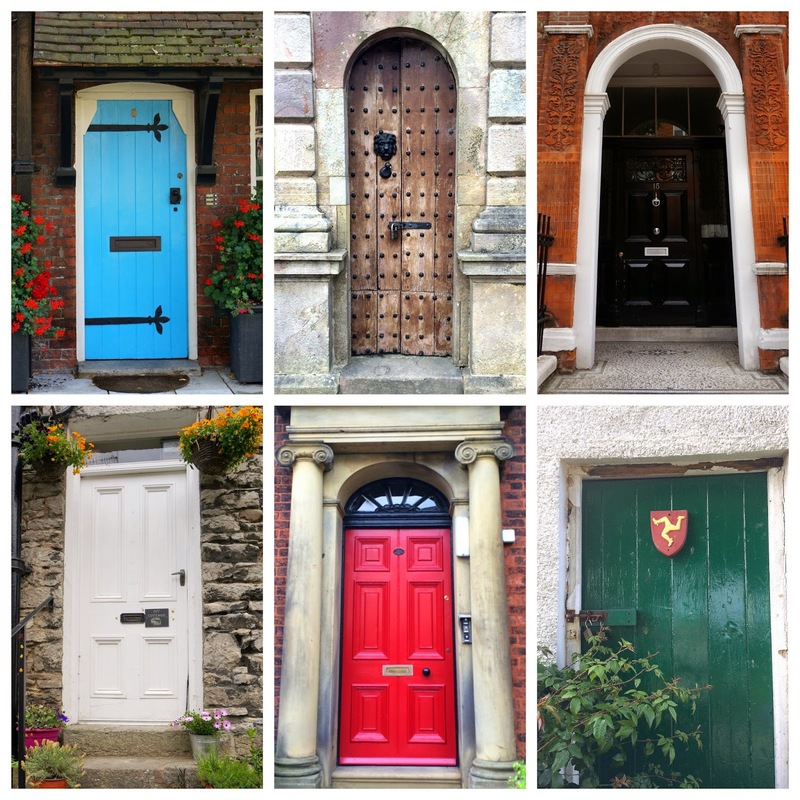 Susan Branch&#39;s book, &quot;A Fine Romance, falling in Love with the English Countryside&quot; and a blog by Tsh, The Art of Simple (decluttering and travelling with kids). Thanks for sharing your once in a lifetime trip. Beautiful post! We visited London in April but did not get outside the city. I appreciate your pictures of places we did not see! Can&#39;t wait for those quilt-inspired pics! Thank you for the lovely pictures. I have traveled extensively through the British Isles and love all of it. Planning on going again in two years with a friend. Your pictures brought back lovely memories. Thank you. Your pictures and post is fabulous! Very beautiful. We leave for Ireland soon and hope our weather is as good as yours was. What an experience you shared with your children! What pretty pictures! My sister served in Manchester England too — I&#39;ll have to share this post with her so she can enjoy them too. I have never been there, but did recognize Pemberly. 🙂 And I appreciate your thoughts on simplifying. I need to get rid of stuff in my house too! Why is it so hard to do sometimes, even if it feels so nice when it&#39;s done? Drool. Oh, Amy, my travel list keeps getting longer and longer. There are too many words and not enough words to describe this post. Love it. Thanks so much for sharing your pictures and details of your trip; it was great to see them. Looks like your family will have wonderful memories for years to come. I loved every word and every picture and will read it all again. I love the UK and have some Welsh waaaaay back and even though I&#39;ve not visited there, I have often felt I would move there in a heartbeat. I noticed such a happy, peaceful tone all the way through your post. I hope you get to live your dream some day! Thanks for sharing and feel free to do that any time! I moved from the UK about 19 years ago so loved reading your post and taking a look at the photos. Thanks for sharing. I agree with Linda above…loved reading every word. Love seeing Mr. Darcy&#39;s pond. 😉 <br />Yes, please…..let&#39;s all simplify. I want to spend time talking over dinner and reading books in the evening by the fire. Yep…we sure were lucky on the weather as I see it basically has been cold there since we left! :)<br /><br />You know of course our love of the UK through you and our girl so I totally understand how you feel and about decluttering. After living in a garage apt for over 25 years I want no parts of all the stuff we have stored in our basement! :) <br />Little and less is very good! Keep the photos coming, I love meeting people in the UK. I got to go to Harrogate and have tea at <br />Betty&#39;s Place ( you never want to leave). Stunning! I am so happy for you! How Wonderful! Love England. Have to get back there soon for a visit! Fabulous Photos, thanks for sharing. Gosh this is so beautiful, someday….! It looks like y&#39;all had such a lovely time. 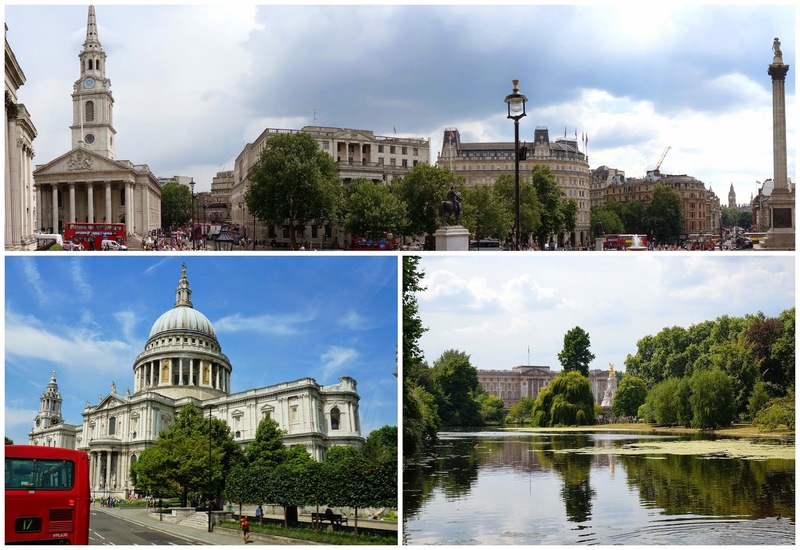 I went to London on vacation in 2009 and absolutely loved it. what beautiful views you had everywhere you spent time! I am enjoying hearing of your travels! your children will always remember it! Thank you for sharing your wonderful holiday adventure. Loved seeing England through your eyes. I too loved seeing those intricate mail boxes and telephone booths. So happy you had such beautiful weather – an extra special bonus. Amy, thanks for sharing your lovely trip (and photos)! I&#39;m sure it felt like so much to see and so little time. Hope you&#39;re able to return. It&#39;s on my list, too! Your pictures are beautiful!! They would make a great wall gallery! I dream of going to England myself. Thank you for sharing highlights of your trip. Thank you for kindly sharing your wonderful trip. It is certainly a beautiful country. How nice you could share it with your family. Thank you! I enjoyed England through your experiences. 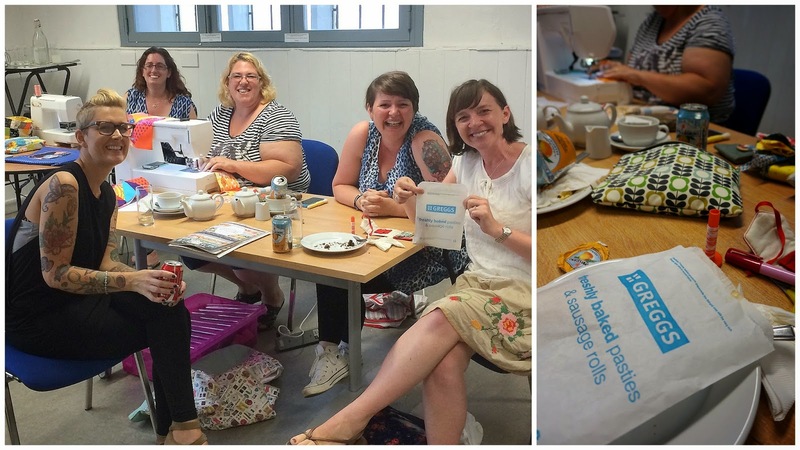 Really enjoyed your post Amy and glad we gave you lovely weather! It&#39;s so interesting to see this beautiful country through someone else&#39;s eyes. 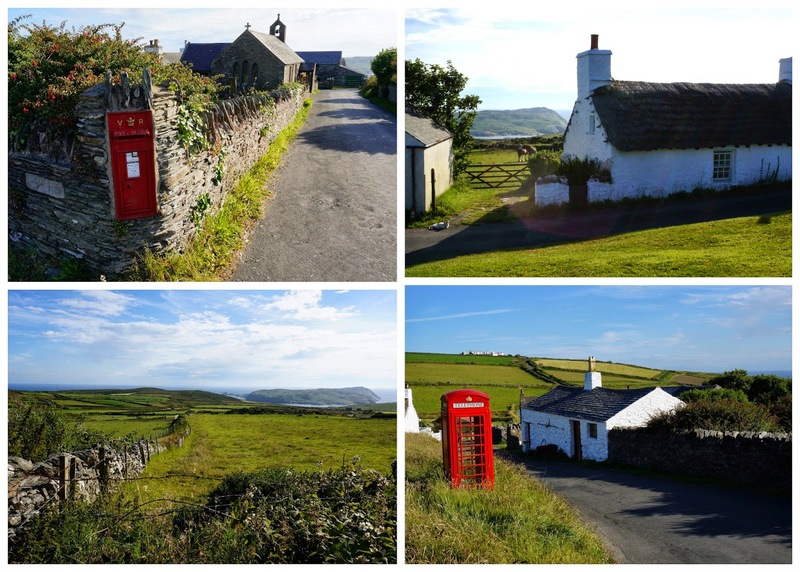 It is lovely to see photos of England through a &quot;foreigner&#39;s&quot; eyes. I sometimes think we don&#39;t appreciate the beauty of our country enough. I am so glad you had good weather and enjoyed your trip here. I think we take so much of what is around us for granted that it takes a fesh pair of eyes for us to appreciate it. Your visit to Leeds MQG was a lovely surprise for us. Thank you so much for letting me live vicariously through you. I will echo all the other comments about how lovely your pictures are and what a sweet post this is. I hear ya on trying to simplify life! Howeeeever… I&#39;m also wondering if you won&#39;t turn that gorgeous tile floor into a quilt pattern for us??? 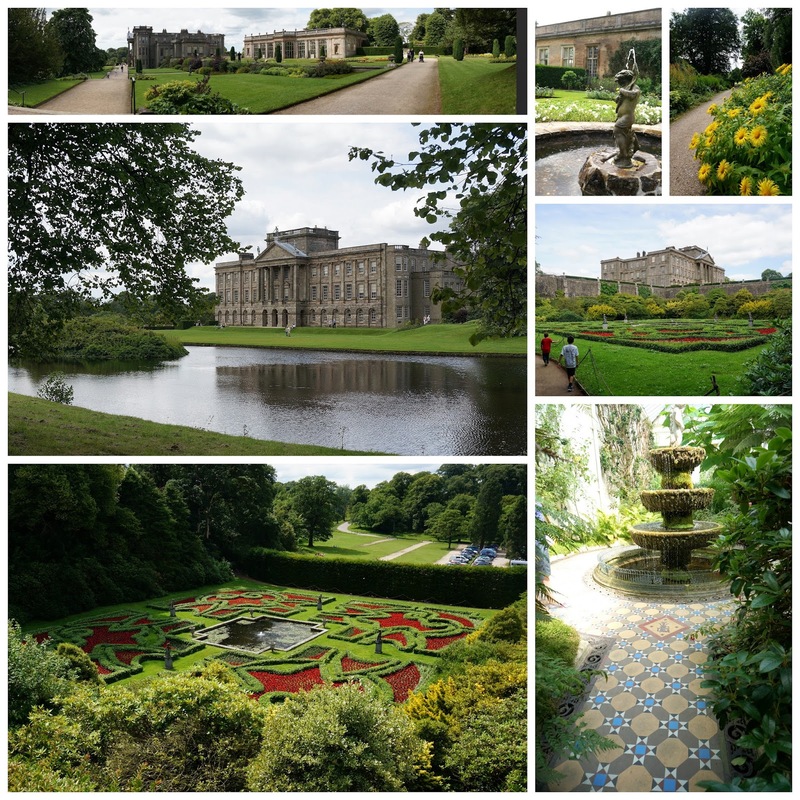 You know: the one at Lyme Park with the Ohio Stars leading up to the fountain? Your trip sounds lovely! I&#39;ve only been to Italy and would love to see the rest of Europe. You and England sound like a match made in heaven. What a wonderful trip! 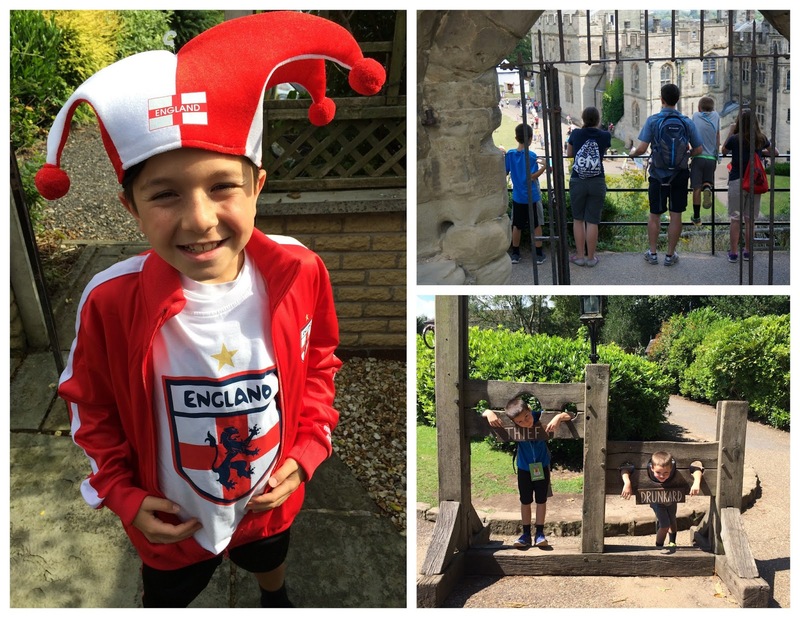 You can tell by your words and photo&#39;s your love for England. I have enjoyed following your journey so much and do believe in abundance and the need to simplify.. And truly I would have been happy with just the pictures of Pemberly -awesome!